We are fortunate to have a talented group of teachers, supportive parents and ambitious students at Freemen’s and it is a winning combination. Download full breakdown of 2018 subject results here. Download 2018 results by subject here. Following major examination reforms, the students and staff of City of London Freemen’s School in Ashtead have had a challenging two years where they have had to negotiate an ever-changing education landscape under increasing levels of pressure. 96% of grades at Freemen’s were graded at A*-B and 9-6 and an impressive 83% were assessed at 9-7, A* and A. These results become all the more remarkable when you consider that these same students have also spent the last two years starring in our various theatre and music productions, achieving sport success as part of our sports teams and regularly volunteering within the local community, not to mention all that they have accomplished in the Duke of Edinburgh Award and CCF. It is no wonder then given the increase in academic expectation and workload, that the press is consistently reporting on the mental health pressures facing young people. This is why the physical and emotional wellbeing of students has become an integral part of day-to-day life at Freemen’s. Everyone at Freemen’s looks forward to watching our GCSE students as they grow and make a difference in the Sixth Form. 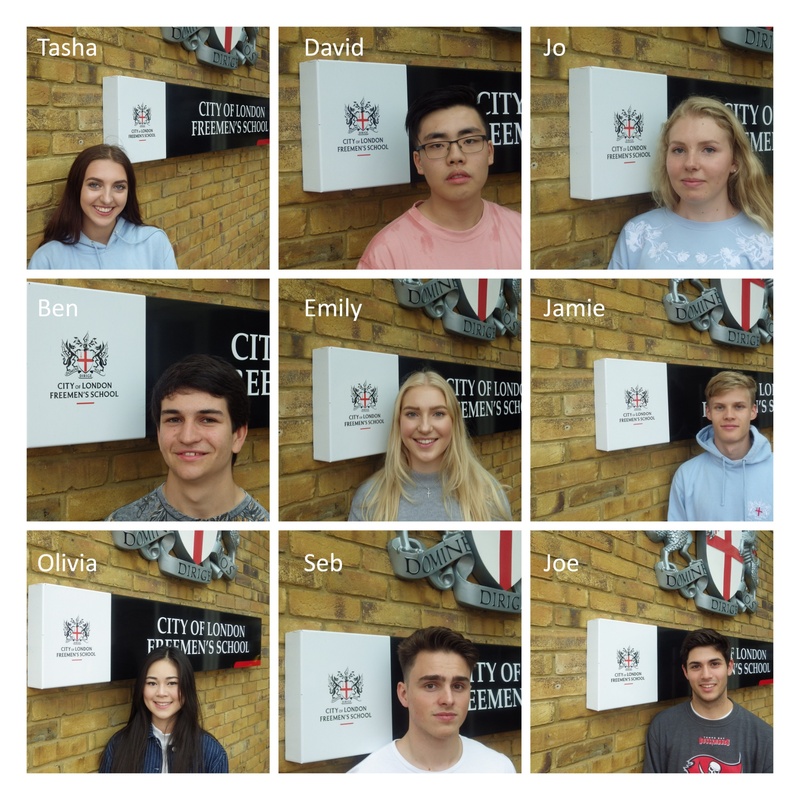 Students at City of London Freemen’s School in Ashtead are celebrating impressive A level results, despite the challenge of the exams changing to the new linear format. 88% of all grades achieved were A*-B, which represents just a 1% drop on last year and 4% increase on 2016. 64% of grades achieved were A* or A grades, while just over 1 in four grades achieved were A*. “This is the first cohort at Freemen’s and nationally to be set the challenge of linear A Levels since Curriculum 2000 was introduced, a significant challenge both for students and teachers across the country,” said Headmaster, Roland Martin. “Important to mention too that teachers across the country have been coping with significant change at A Level and at GCSE these last two years and I should like to commend colleagues here at Freemen’s and professionals nationally for the dedication that they have shown during difficult times for teachers”. 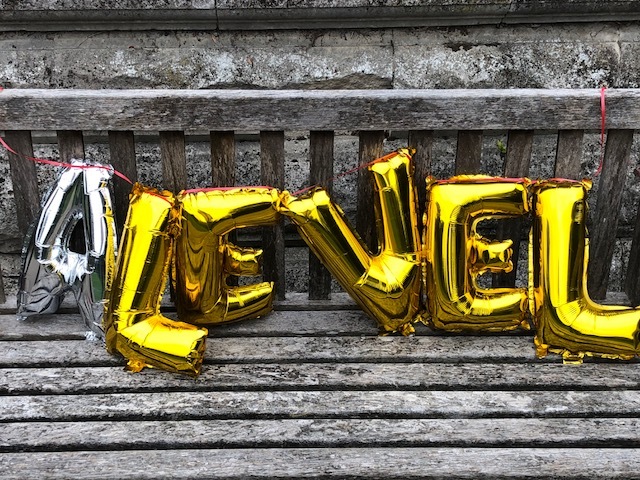 Last year’s cohort broke all records for the School in terms of A Level results and it is much to this year’s group’s credit that they have taken inspiration from those successes and pushed themselves to achieve such strong results. We should like to congratulate our students here not only on their impressive A level results, but also for the difference their contributions have made to sport, music and drama, as well as to the local community, while striving for this academic success: this is all part of the relevant education that we aim to provide at Freemen’s of which, of course, examination outcomes only play a part. It is inspiring to see what a group of well-rounded young people, extraordinary teachers, a very strong Sixth Form leadership team and collaborative parents can achieve when they work so closely together. 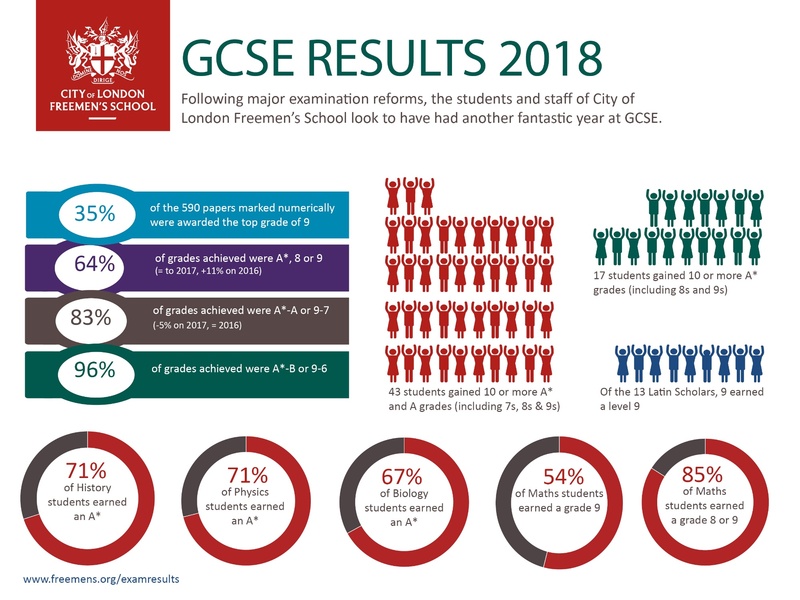 Roger Chadwick OBE, Chairman of the Board of Governors of the City of London Freemen's School, commented, “Congratulations to all the students for achieving excellent A Level results. We know that a lot of hard work goes into preparing for these examinations and the students, staff and parents should be very proud. I am delighted that in a year when the School has benefitted from a successful Inspection outcome that staff at the School have managed to maintain such high academic standards. The City of London Corporation is committed to providing access to world-class education and learning opportunities. This is also the first cohort to leave Freemen’s following the introduction of its new Free Minds curriculum for the Sixth Form which offers students a broader experience of learning. This Autumn, the school will begin the refurbishment of the Mansion House at the heart of Ashtead Park into a new Sixth Form Centre. Meet the real students behind the results. Read their stories here. 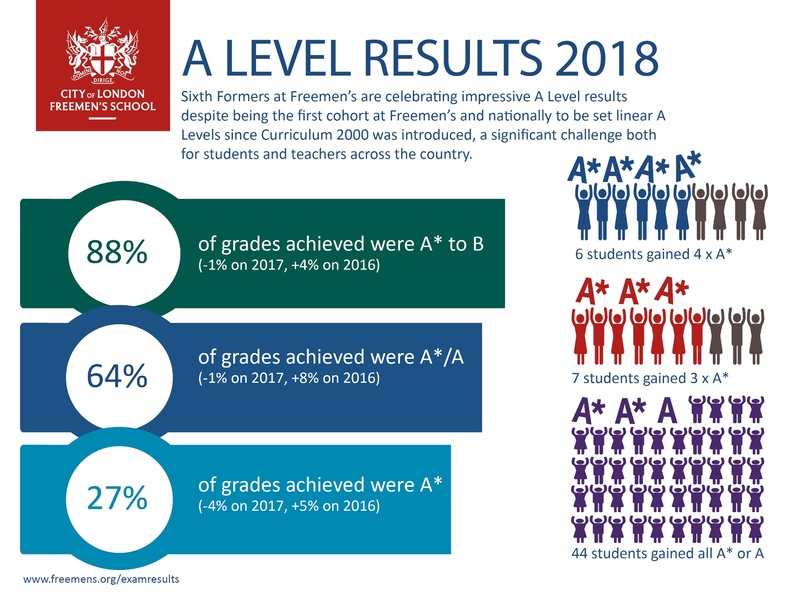 City of London Freemen’s School in Ashtead is celebrating excellent A level results, recording some of its best results in the last six years. 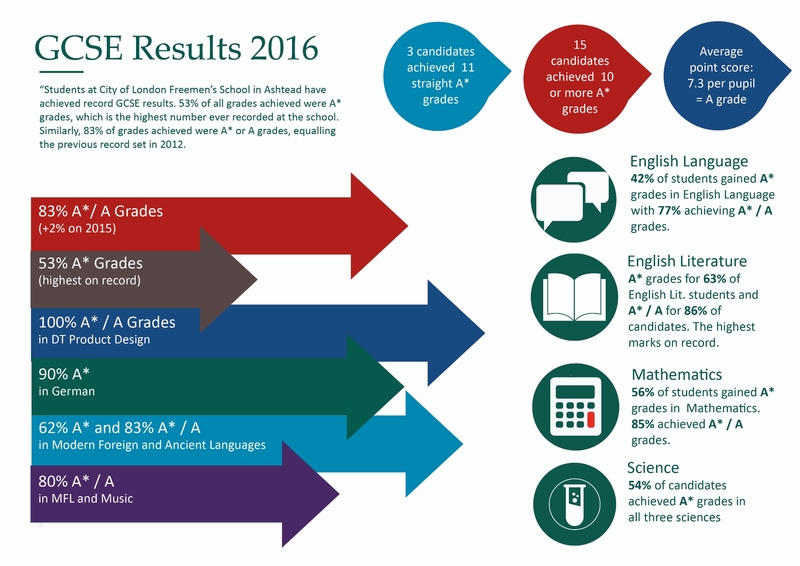 31% of all grades achieved were graded A*, an 9% increase on 2016 results. 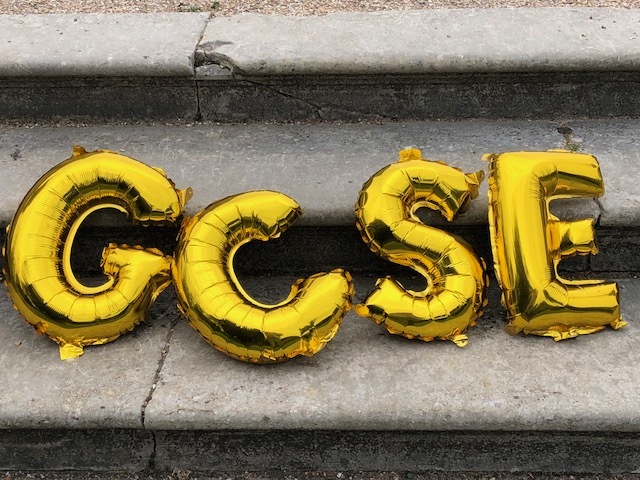 65% of grades achieved were A*-A, which represents not only 9% more A*/ A grades on 2016, but also a 10% increase from the AS level results this same cohort achieved last year, despite the second year of A levels being significantly harder than the first. “These results are testament to the hard work that students and dedicated staff have put into this last year,” suggested Headmaster, Roland Martin. “We are fortunate to have a talented group of teachers, supportive parents and ambitious students at Freemen’s and it is a winning combination. Results like these need to be put into the context of a busy School: the accomplishments these same students have made to sport, music, drama and socially in the School, as well as their contributions to the wider community, are equally noteworthy and we are all very proud of the leavers of 2017. Click on the link below to see the 2017 A Level results by subject. Students at City of London Freemen’s School in Ashtead have once again achieved record GCSE results, surpassing last year’s exceptional year. 64% of all grades achieved were A* grades, which adds 10% to last year’s record-breaking results. 88% of grades achieved were A* or A grades, surpassing last year’s record-equalling 83%. "The press has been reporting for a week that this has been a difficult and erratic year for GCSE results and teachers and pupils in schools across the country have certainly been under increased – and frankly unacceptable – pressure these last few years to get their heads round a new set of reforms that have been implemented suddenly and haphazardly. With this national landscape in mind, the hard work that my colleagues at Freemen’s have put in to support the equally conscientious pupils in this year group has to be commended. Having broken school records at GCSE last year, to go to greater heights this year is a phenomenal achievement and says much about the positive culture in this School: the ambition of its pupils; the support of parents; the professionalism of teachers; the leadership of the Academic Deputy Head, Heads of Department, Heads of Section and Heads of Year as well as guidance from Form Tutors. Days like this certainly give cause for celebration and pride," Headmaster, Roland Martin suggested. After record breaking results last year in both English Language and English Literature, there have been further improvements in 2017, with 71% A* grades at Literature (91% A*/A) and 45% A* at Language (89% A*/A). Drama has also seen notable improvement on last year (28% A*). City of London Freemen’s School in Ashtead is once again celebrating following success in its A Level results. 83% of all grades achieved were A* / B grades, 55% were A* or A grades, while 22% were A* grades. “We are delighted by this year’s A Level results and they are all the remarkable given what else these students have also accomplished in the School during their time, here. When you put such impressive academic performances alongside the contributions that these same pupils have made to the sporting, musical, dramatic and social side of the School, you get a picture of genuinely well-rounded young people, which is what a Freemen’s education is about,” suggested Headmaster Roland Martin, who has just completed his first year at the School. “It is thanks to the hard work and dedication of our students and staff, with support from parents, that these students remain ambitious about what they might achieve in and out of the classroom. Students at City of London Freemen’s School in Ashtead have achieved record GCSE results. 53% of all grades achieved were A* grades, which is the highest number ever recorded at the school. Similarly, 83% of grades achieved were A* or A grades, equalling the previous record set in 2012. Download results by department here. “These GCSE results are outstanding and our students, staff and parents should rightly be proud of these achievements. Nonetheless, these percentages do not show the whole picture. "It is particularly impressive that as well as studying English Language and Mathematics at GCSE, every pupil here takes a compulsory core of five subjects, including not only English Literature, but also all three separate Sciences. Over 50% of students obtained A* grades across all three Science disciplines. It is also worth noting that in a society that seems to have become sadly more linguistically insular, students at Freemen’s continue to excel at Languages - both Modern and Ancient. "Then, of course, they also continue to flourish outside the classroom in sport, music, drama, as well as in community activities, which cannot always be reflected in exam grades,” suggested Headmaster, Roland Martin, who has just completed his first year leading the School. Individual subjects saw some record results too. A third of students gained A* grades in both English Literature and Language, with 77% achieving A*/A grades in English Language and 86% attaining A*/A grades in English Literature; our highest results on record. 100% of students achieved A or A* in DT Product Design. There were A* grades for 90% of candidates studying German and 80% A* or A grades for Music students.